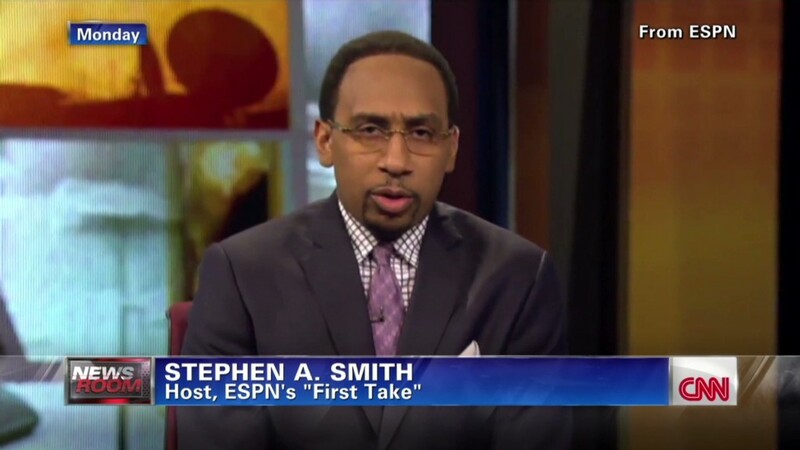 ESPN on Tuesday announced a one-week suspension for one of its most controversial commentators, Stephen A. Smith, in the wake of his widely-criticized remarks about domestic abuse that referred to possible "provocation" by victims. The move came one day after Smith appeared on his ESPN2 talk show "First Take" and profusely apologized. Smith's original remarks were shown on "First Take" last Friday. He was discussing the assault charge against Baltimore Ravens running back Ray Rice, who was indicted in March for striking his then-girlfriend and dragging her out of an elevator, and the leniency shown by the National Football League, which suspended Rice for only two games. He said that while men "have no business putting your hands on a woman," he had tried to tell women in his family, "Let's make sure we don't do anything to provoke wrong actions." He also referred to "elements of provocation" and implied that women should "do what we can to try to prevent the situation from happening." During his apology on Monday morning, Smith acknowledged that "my words came across that it is somehow a woman's fault." "This was not my intent. It is not what I was trying to say," he said. "Yet the failure to clearly articulate something different lies squarely on my shoulders." Following the apology, Smith appeared as usual on Monday and Tuesday's telecasts, suggesting that ESPN would take no disciplinary steps. But on Tuesday afternoon, the network said that he "will not appear on 'First Take' or ESPN Radio for the next week. He will return to ESPN next Wednesday." In an internal memorandum, ESPN President John Skipper said, "We have been engaged in thoughtful discussion about appropriate next steps. Those conversations have involved a diverse group of women and men in our company." He specifically credited ESPN's women's employee resource group, saying it had "added to the conversation and going forward, I know they will help us continue constructive discussion on this and related issues." "Stephen has called what took place 'the most egregious mistake' of his career. I believe his apology was sincere and that he and we have learned from what we've collectively experienced," Skipper said in his memo. "I'm confident we will all move forward with a greater sense of enlightenment and perspective as the lasting impact of these last few days," Skipper added. "I want to thank all those whose thoughts have contributed along the way."